Glass beads and the art of bead making date back to around 3,000 years ago, making it one of the oldest of art forms. There are many different types of glass beads and they are typically categorized and named after the method used to manipulate and form the glass. Here we take a look at the many different varieties of glass beads available. The winding method is likely the earliest method used to make true glass beads. Glass is heated to a temperature hot enough to make it capable of being bent or wound into different shapes. In this state the glass is referred to a being “ductile”, or workable. In this case, the glass is wound around a steel wire or mandrel which is coated with a compound that will allow the bead to release. The shape or design of the wound beads can be further manipulated while the material is still hot by using various tools. Pressed or molded glass beads are less expensive to produce and originated in the Czech Republic. In this method, thick rods are heated to a molten state and then fed into a complex piece of machinery that stamps the glass and pierces a hole in it. Next, the beads are rolled in hot sand which is done to remove soft seam lines as well as flashing. By using canes, another name for the glass rods, more elaborate patterns can be made, and more beads can be produced. These beads are very sparkly due to the high lead content, which also makes them very fragile. These beads are both cut and polished by a machine. Furnace glass beads require the use of an annealing kiln and large capacity glass furnace for the manufacturing process. This method of bead making incorporates the Italian glass blowing techniques of zanfirico and latticino. This process uses large glass canes made up of smaller canes which are encased in a clear glass and shaped to make beads with twisted striped patterns and linear patterns. The crackle glass technique was developed by glass makers in Venice during the 16th century. The process involves taking a molten hot bead and placing it in cold water. This causes the glass to crack. The glass is then re-heated and then moulded or hand-blown into the desired shape. The re-heating of the glass gives it a smooth surface and also seals the bead. This method of creating glass beads is very ancient, dating back to the second century AD, when they were heavily used for purposes of trading. Many methods can be used to make drawn glass beads, and all methods revolve around pulling a strand from a gather of glass in such a way that it creates a bubble in the center which will become the hole in the bead. An example of a mechanically drawn glass bead is the modern seed bead. 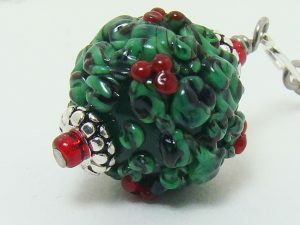 Lampworking is a variation of the wound glass technique which originated in Venice when large quantities of beads were produced for the African trade during the 19th century. The lampwork artists would melt thin rods of glass using a torch flame. The molten glass was then wound around a mandrel which creates the hole for the bead after it is slipped off of it. The beads are then placed in a kiln for several hours where they will slowly cool down to prevent cracking in a process known as kiln annealing. Lampwork beads can be plain or decorative. Decorations are created by adding color to either the surface of the bead or by placing color into the center of the bead to make floral designs. Dichroic glass has a thin film of metal that has been fused to the surface that results in a metallic sheen on the surface that appears two different colors depending upon which angle it is viewed from. These beads are made using traditional lampworking techniques or by pressing. Dichroic glass is being used more frequently in the production of high-end art beads. Czech beads are also known as Czech Republic Beads, named for where they were made. In the mid-nineteenth century, the place formerly known as Czechoslovakia was the largest producer of glass beads. Some examples of Czech beads include Druc beads, which are simply pressed, round glass beads that come in many colors and finishes. Fire Polished beads are also a Czech bead, featuring machine faceted glass beads which are colored and then coated and polished inside a blazing hot oven. Pressed Glass beads are also a type of Czech bead and are made by placing molten glass into a mold to make various shapes. Pressed glass beads come in several different qualities, from more expensive ones, to less expensive ones where the pressed seam may still be visible. Another common type of Czech bead is the Cathedral Bead, which are elegant looking beads that are placed into a steel mold to give them somewhat of a faceted look. Both ends of the bead have a metallic texture and make the bead resemble a bead cap. These are beads made in the country of India. India produces a very wide and endless variety of glass beads, many of which are intricately detailed and decorated. The technique of making powder glass beads originated during the sixteenth century in Ghana, Africa. Scrap glass from objects such as old soda bottles is taken and then crushed into a fine powder. The glass powder is then layered and colored, put into a mold and then fired. This type of bead is also referred to as Dry Powder Glass Beads and sand cast beads. Chewron beads originated in Venice, Italy and are built from several different layers of glass, starting with a hollow cane made by blowing air into molten glass. Then the bead is layered with six layers of colored glass, in order: white, blue, white, brick red, white, and blue. Each layer is dipped into a star shaped mold, making the pattern of a star on each layer. Then the bead is stretched into a long cane and the air bubble forms the hole. After the cane of glass cools, it is cut into segments that become each bead. Each segment is then ground and the star pattern and inner layers are visible. Only the ground beads are considered to be actual Chewron beads with flat end segments being called a Rosetta or star bead.